Mt. Myojin (明神山, Myojinyama) is one of the best spots to see Mt. Fuji. You can reach the top with Panoramadai/Sangokuyama Hiking course. You can also see great view of Lake Yamanaka. Panoramadai Hiking course is very open space but it has a sharp inclination. If you are not hiker, but you want to see the best view of Mt. Fuji. Drive up to Sangokutoge. There is parking for hikers. It will be only 30 min. hiking. However, the grade is even higher. This is the best view point for Mt. Fuji. You can visit here Summer or Winter. Even in the winter, because the course does not have trees and bushes much, it will be easy. You could see wild deer. There are lots to more when you visit here and see Mt. 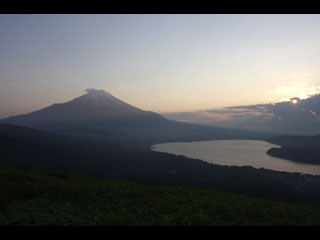 Fuji on real eyes than pictures or video. Just feel Mt. Fuji here.